The title of this post is drawn from Mark Monmonier’s entertaining book, which I remember from my Geography degree. Maps can be fantastic ways of conveying complex spatial information. However, like speeches and presentations, maps can also be subject to bias, in both what is presented and what is ignored. Exercising a degree of skepticism when reading a map is good practice, and helps minimise misinterpretation. At the time, many areas of the east coast were being flooded directly and consequently the level of media attention was relatively high, with several outlets picking up on this ‘good news story’. I’ve included a couple of lines from this Evening Standard article from 8 December which included this map. 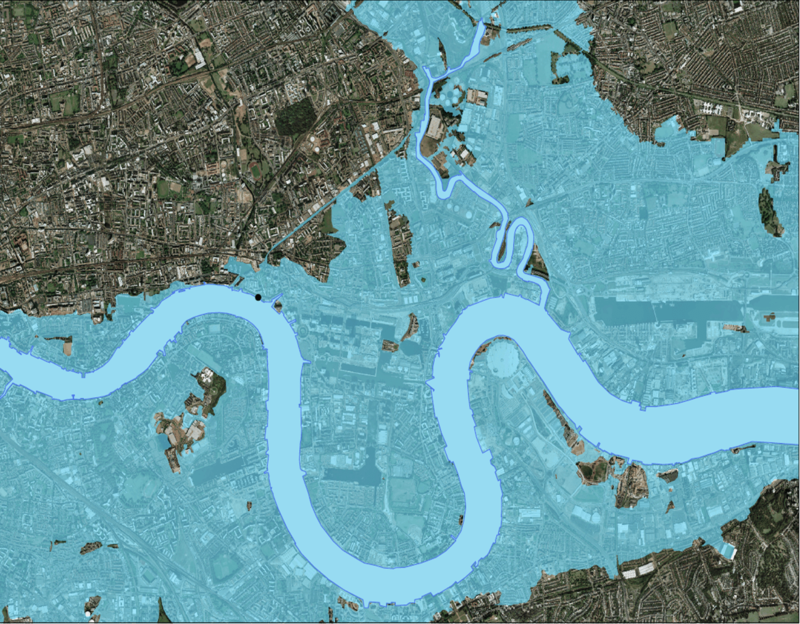 Submerged: vast swathes of London would have been underwater if the Thames Barrier had not shut. This apocalyptic picture shows the devastation London would have faced if the Thames Barrier hadn’t protected the capital from the worst tidal surge in 60 years.Vast swathes of London would have been submerged but for the defences, experts predicted. The original EA tweet is technically accurate, the shaded area shows the areaprotected by the barrier. However, to tweet it during active flooding may have led to some misinterpretation. It is NOT a map showing the area which would have been flooded had the Thames Barrier have been non-operational last week. Whilst the events of last week were significant, they were not approaching the 1 in 1000 year flood events that the EA modelling is based on. Had the Thames Barrier not been in place last week, tide levels would have peaked at 0.2m below the top of flood defences. So rather than ‘vast swathes of London being submerged‘ actually, all of the water would have been confined to the river channel. My main issue with the map is not that it exists, but the way in which it has been interpreted. It’s a useful planning tool to describe possible flood extent (which is one of London’s top risks), but don’t be fooled into thinking that because a map is released at the time, it represents the current situation. And whilst I’m moaning about maps…why choose to only show that area? Predicted flood impacts clearly extend beyond the map view chosen, so why exclude the other areas? 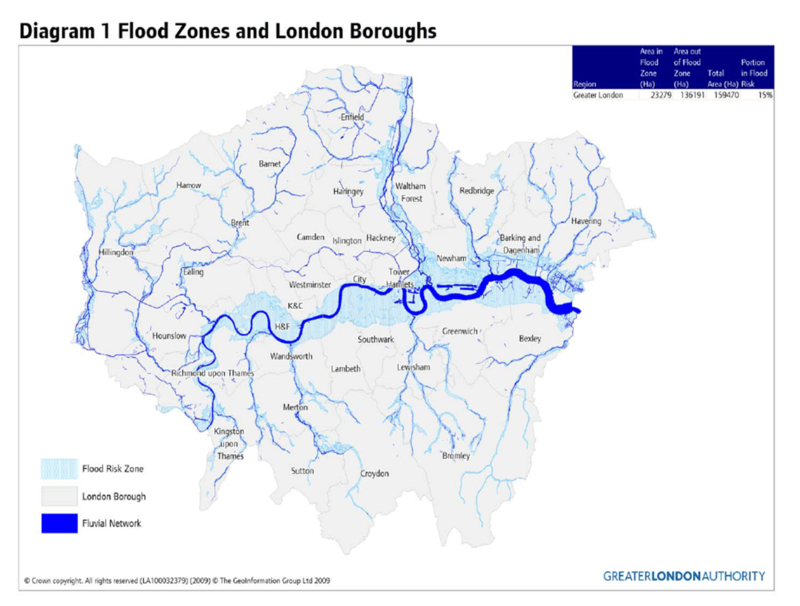 Yes, I expect people are familiar with those particular river bends from Eastenders, but it would have provided a more complete picture similar to that in the London Regional Flood Risk Assessment (although this shows flooding of mutiple types). What does the map show ? – try to find out as much as you can about the data. When was the data collected? Was it summarised or simplified before being displayed? Who made the map? What are they trying to get you to take away from looking at it? Have you spotted any misleading or hard to interpret disaster maps? I’d love to see other examples!